Hadhrat Imam Rabbani Shaykh Ahmad Sirhindī, may Allah be pleased with them. Signs of Wilayah (sainthood) were visible in him from childhood. He was never seen playing around like other children. At the age of 11, he memorized the Holy Qur’ān by heart. At the same age, he also received the Naqshbandī tarīqah from his father. Once when he was young, he went to Lucknow, accompanied with Maulana Ziā’un-Nabī who was from his close relatives. When he would go to the masjid, he would pass by a Durwesh who usually remained naked. But whenever he would pass, the Durwesh would cover up his private parts (Satr in Shariah). Someone asked him, why do you cover up when you see this boy? He replied, he (Shah Abū Saeed) will one day reach a high rank that he will be the focus of his relatives. Thus the words of that Durwesh came true. He learned Tajweed from Qāri Naseem. He had a beautiful voice and used to recite the holy Quran in a wonderful style. Yet he remained in doubt about the quality of his recitation as he did not believe in the admiration of non-Arabs, until when he received appreciation from the Arabs in Makkah. He graduated in the Islamic sciences when he was 19 years old. He had learned all the major Islamic courses and books, many from Mufti Sharaf ad-Dīn, and some from Maulana Rafī’ ad-Dīn Muhaddith who was son of Hadhrat Shāh Walī-Allah Dehlavī. He also learned Hadith literature from other luminaries such as Shāh Abdul Azīz Dehlavī, his uncle Maulānā Sirāj Ahmad Ibn Muhammad Murshid, and later also from his own shaykh Hadhrat Shāh Ghulām Alī. He developed the wish for seeking the path of Tarīqat during education, and first was initiated into this noble way by his own father Shāh Safī al-Qadr (d. 29 Sha’ban 1236 / May 1821), who was a great ascetic and a Shaykh of Mujaddidi tarīqah. After graduation, with the permission of his father, he went to a famous shaykh Hadhrat Shāh Dargāhī (1162-1226 AH, 1749-1811 CE) and was initiated into the path by him. Shah Dargāhi was a saint by birth, who had strong ecstatic states and used to remain in ecstasy except for the prayers. His spiritual lineage was connected to Hadhrat Khwāja Muhammad Zubair (1093-1152 AH) with only two intermediaries. He was also initiated in the Qādri order by Hadhrat Hāfiz Jamāl-Allāh (d. 1209 AH in Rampur). He was a miraculous man – people in his proximity would get affected by his spiritual ecstatic states and would sometimes turn unconscious. Very soon, Shāh Dargāhī authorized Shāh Abū Saeed in tariqah and made him his spiritual successor. He started training disciples and seekers. He also imparted strong spiritual effects in his followers. His disciples would get ecstatic and unconscious in his company. While having complete khilāfah and large number of disciples gathering around him, his thirst was still not quenched and he started looking around to get another perfected Shaykh of Mujaddidi tariqah to achieve still higher spiritual stations. He wrote a letter to the famous Indian scholar Qādī Thanā-Allāh Pānīpatī (d. 1225 AH / 1810 CE), author of Tafsīr al-Mazharī and khalīfa of Mirzā Mazhar Jān-e-Jānān (1111-1195 AH), and requested for spiritual guidance, who replied that the better option would be to go to Hadhrat Shāh Ghulām Alī Dehlavī, who was the greatest Shaykh of Naqshbandi tariqah in India at that time and the chief deputy of Mirzā Mazhar. Hearing this advice, he came to Shāh Ghulām Alī and was initiated by him on 7 Muharram 1225 AH (February 1810). [Hidāyat al-Tālibeen] Shāh Ghulām Alī trained him very well and he reached highest stages of Wilāyah (sainthood) and got perfection in all matters. His Shaykh loved him very much due to the fact that he had left his circle of disciples and became a murīd even being himself a Shaykh before, only to seek further nearness to Allah the Exalted. Shāh Ghulām Alī also gave him complete Ijāzah (authority) in the Mujaddidi tarīqah and he started training new disciples. His followers requested him to write a treatise on the method and practices of the Mujaddidī method. He wrote Hidāyat al-Tālibeen in Persian, a book containing short but complete details of this exalted method of Sufism, and soon this book became popular and was considered a textbook of Tarīqat by the followers of Shāh Ghulām Alī and other Mujaddidi circles. This book has been published and translated in multiple languages. Along with the Naqshbandi Mujaddidi tariqah, he also received permission in other major Sufi orders such as Qādrī and Chishtī. His chain of spiritual lineage goes as follows: he received Ijāzah from Shāh Ghulām Alī Dehlavī, who received it from Mirzā Mazhar Jān-e-Jānān, who received it from Sayyid Nūr Muhammad Badāyūnī, who received it from Hāfiz Muhammad Mohsin Dehlavī, who received it from Khwāja Saifuddīn Fārūqī Sirhindī, who received it from his father Imām Muhammad Ma’sūm Sirhindī, who received it from his father Imām Rabbānī Shaykh Ahmad Sirhindī, who received it from his Shaykhs and the chains of different orders go to the Messenger of Allah Muhammad Ibn Abdullah, may peace and blessings be upon him. He had a beautiful calligraphic handwriting, and he completed writing the Holy Qur’ān in bold style in 1244 AH. This copy of the Holy Quran with 888 pages is preserved in Rubāt Mazharī in Madinah the Illuminated, Saudi Arabia. Once he was traveling from Rāmpur to Sanbhal and came across a river during night, at the start of Ishā prayer time. He boarded a boat on the riverbank, but there was no sailor, only the boat owner was there who was a polytheist. He asked him to sail the boat, he did it without hesitation inspired by the awe of Shaykh even though he did not know how to sail. The boat safely sailed and they arrived at the other bank. Seeing this miraculous journey without a boatman, the boat owner converted to Islam. One of his disciples Muhammad Asghar narrates that I missed the Tahajjud prayer (late night prayer) very often. Once I told the Shaykh about it, he said you can ask my servant to remind me at the time of Tahajjud, I will wake you up. I can only do this, rest lies with you (i.e., I can only wake you up, praying Tahajjud is your duty). He did that, and the next day onwards he would wake up daily as if someone had made him wake up. One of his disciples used to remain in ecstatic states and could not decide the direction to qiblā in prayers. He complained about this to the Shaykh, who said, you should direct your attention to me before Tahrīmah (start of prayer) and I will guide you towards the qiblā. Thenceforth, it happened that whenever he would remember him before starting the prayer, the Shaykh would appear and show him the direction towards qiblā. While going for Hajj, he booked his seat in a ship in Mumbai (that sailed to Jeddah carrying people for Hajj) and paid for it. Later, he canceled the booking saying it does not seem fine to sail in this ship. This [cancellation] was part of the contract. Then he booked in another ship and reached for Hajj within due time, while the first ship arrived late, after the Hajj had been performed. He was a beloved and most approved deputy of Shāh Ghulām Alī, who not only loved him extremely, but also appointed him as his spiritual successor in the noble khānqāh Mazhariya in Delhi. On 11 Jamādā al-Awwal 1231 AH / 1816, Shah Ghulam Ali said that he (Abū Saeed) shall sit in my place after me, and should lead the Halaqah of Dhikr and the lessons of Hadīth and Tafsīr (as he did himself). He said, some people wonder why is he so special? Don’t they see that Abū Saeed has left his circle of disciples to be my disciple, even with having khilāfah by other Shaykhs! In Jamādā al-Awwal 1233 A.H. / 1818, Hadhrath Shāh Ghulām Alī gave him the glad tidings that he was appointed to be the Qayyūm. He said, I have seen in vision that you are sitting on my place and the Qayyūmiyah (the high position of being a Qayyūm) is bestowed on you. Shāh Abū Saeed was in Lucknow when Hadhrat Shāh Ghulām Alī got sick for the last time (before death). He wrote him letters, one after the other, to call him back as soon as possible as he wanted to make him the ultimate successor to him and to the noble khānqāh. Thus, he became the heir to this throne of spirituality in India. 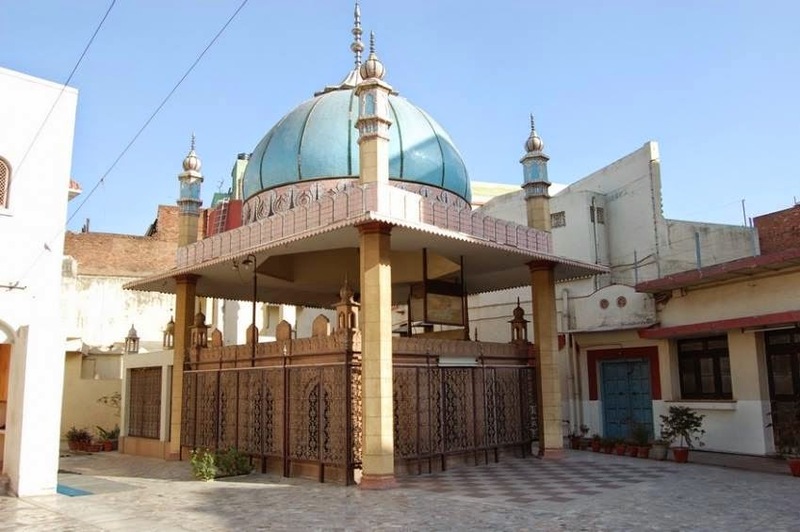 Shāh Ghulām Alī parted to the eternal world on 22 Safar 1240 AH (October 1824 CE), leaving behind this jewel of the Mujaddidi dynasty to train and guide the seekers of this noble path. He trained thousands of followers in this noble path for nine years, before leaving for Hajj in 1249 AH. Mawlānā Khālid al-Baghdādī was one of the greatest deputies of Shāh Ghulām Alī who had hundreds of thousands of followers in the Middle East. He used to send some of his murīds (disciples) to Hadhrat Shāh Ghulām Alī for further training and guidance, and also advised many of his followers to follow Hadhrat Shāh Abū Saeed. Mawlānā also sent a letter to Shāh Abū Saeed describing the popularity of Naqshbandi tarīqah and its rapid spread in the Middle East through his efforts. The people of Delhi were grieved when they knew that he was leaving for Hajj. He appointed his elder son Shāh Ahmed Saeed, may Allah sanctify his soul, as his representative in the khānqāh. During the journey, he was welcomed and venerated in every city and town he passed. He reached Mumbai during Ramadān, left for Hajj in a ship in Shawwāl and reached there in start of Dhu al-Hijjah. He was welcomed there by Shaykh al-Haram Maulānā Muhammad Jān, one of the leading deputies of Hadhrat Shāh Ghulām Alī Dehlavī. All the scholars, shaykhs and other dignitaries of Makkah met him with high reverence, including Shaykh Abdullāh Sirāj, Mufti of Shafi’ī fiqh Shaykh Umar, Mufti Sayyid Abdullah, Mīr Ghanī Hanafī and his uncle Shaykh Yāsīn Hanafī, and the great scholar Shaykh Muhammad Ābid Sindhi (d. 1257 AH / 1841 CE). He performed the Hajj and got sick in the same month (Dhu al-Hijjah) with dhiarrhea and fever. Being severely sick and almost unconscious, the love of Madinah overpowered him and he left for that illuminated city when he got little better. He spent the month of Mawlid (Rabī al-Awwal) in that holy city. A person saw in a dream that the Messenger of Allah, may peace and blessings be upon him, is going to the Shaykh’s house, and that everyone is going on foot except Hadhrat Umar the Commander of the Believers. Someone interpreted it as, Hadhrat Umar was distinguished because Shāh Abū Saeed is his descendant. He also held the Halaqah of Dhikr there, and large number of people would attend it. The Shaykh of the Haram invited him, saying he was inviting on behalf of the Holy Prophet, may peace be upon him. In Madinah, his sickness diminished and he could easily walk a mile. But it intensified again as he traveled back. When Ramadān started, he fasted on the first day to know if it is possible for him to fast during this holy month. But that fast intensified his sickness, so he ordered for the Fidya (charity to compensate for the fast in certain situations) to be paid on his behalf. He said, I would like to pay Fidya even though it is not required for sick and travelers in Sharia. On 22nd Ramadān he reached the Tonk city (India) and the Nawāb of Tonk showed high reverence and esteem for him. On the day of Eid he said the Nawāb should not visit me, as I feel darkness with the arrival of rich and worldly persons. He advised his son Shāh Abdul-Ghānī to follow the Sunnah and to avoid the worldly people. He said to his son, I authorize you and Abdul-Mughnī (his third son) in all the practices and recitations (Ashghāl and Aurād) that I have received [the authority of]. After Zuhr prayer, he asked a Hāfiz to recite Surāh Yāsīn. When Hāfiz had recited it three times, he asked him to stop, saying not enough time was left. He parted from this world between the Zuhr and Asr prayers on the day of Eid al-Fitr, Saturday 1st Shawwal 1250 AH (31 January 1835 CE). The Nawāb Wazīr al-Daula and the people of the city gathered in his Janāzāh prayer which was led by the Qadi of the city Maulānā Khalīl al-Rahmān. His sacred body was brought to Delhi for final burial. When the coffin was opened there after almost forty days, his body was so fresh it seemed he had just been bathed. The cotton fiber placed underneath his body was fragrant with a pleasant scent, taken away by people as a relic and blessing. He was buried alongside his masters in the Khānqāh Mazhariyā in Delhi. 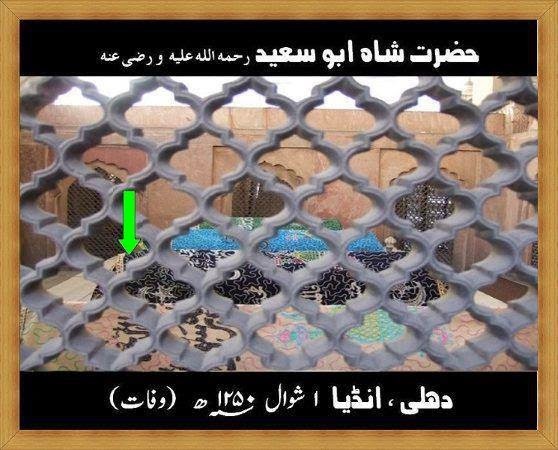 He was succeeded by his elder son Hadhrat Shāh Ahmad Saeed who was one of the great deputies of Hadhrat Shāh Ghulām Alī. One of his earliest disciples Shaykh Ahmad Bakhsh came to Delhi to visit his illuminated grave. Shāh Abū Saeed commanded him in dream that the certificate that you obtained from the British and is still there in your luggage, tear it up as it is not appropriate for Islam (meaning that a Muslim should not seek the pleasure and approval of non-believers). Shaykh Ahmad Bakhsh says I did not even remember that the paper was with me, and when I searched my luggage I found it. I tore it in pieces and the love of non-believers was removed from my heart. He had three sons. The elder, Hadhrat Shāh Ahmad Saeed Mujaddidī Fārūqī, may Allah have mercy on him, was a great scholar, famous Shaykh and was trained and authorized in Tariqat by Hadhrat Shāh Ghulām Alī. He was the true spiritual heir of his Shaykh whom he succeeded after his father. He migrated to Madinah al-Munawwara where he died in 1277 A.H.
His second son was Hadhrat Shāh Abdul-Ghanī Fārūqī, a great scholar of Islamic sciences, who sought tariqah from his father and then completed the Sulook from his elder brother. His third son was Hadhrat Shāh Abdul-Mughnī Fārūqī, who was also an eminent scholar and shaykh. From his spiritual descendents, following names of his khulafa are reported in his biography, although it is expected that he would have blessed many more with this noble award. Hadhrat Shāh Raūf Ahmad Rāft Mujaddidī (d.1253 AH), his cousin. He first received khilafah from Hazrat Shāh Ghulām Alī, then from Shāh Abū Saeed Mujaddidī. Hadhrat Shāh Khateeb Ahmad Mujaddidī (1224-1266 AH), son of Shāh Raūf Ahmad Rāft. Hadhrat Shāh Abdul Ghanī Mujaddidī (1234-1296 AH), a great Muhaddith and author. He was the second son of Shah Abū Saeed. He received Sulook and khilafah from his father, and later from his elder brother Shaāh Ahmad Saeed. Hadhrat Shāh Abdul Mughnī Fārūqī Mujaddidī (1239-1292 AH), third son of Shāh Abū Saeed Mujaddidī. Born in Lucknow and died in Madinah al-Munawwarah. Hadhrat Maulānā Muhammad Sharīf (1198-1260 AH): received education in Rāmpur and then sought the tariqah from Shāh Abū Saeed, received khilafah and then went to Kashmir and Punjab where many people benefited from him. He died in Hoshiārpur and the corpse was transferred to Sirhind and buried there near the shrine of Khwaja Muhammad Ma’sūm. His biography in Urdu is recorded in the book Tazkirah Mashāikh-e Naqshbandia by Maulana Noor Bakhsh Tawakullī. Hadhrat Mullā Khudā Burdī Turkistānī: received tariqah from Shāh Abū Saeed while he was in Lucknow. Then went to Bulgaria where many people were blessed by him. Hadhrat Mullā Alā’uddīn: received the training of Sulook from Shah Abū Saeed and went to Peshawar and spread the tariqah there. Hadhrat Maulānā Abdul-Karīm Turkistānī: came to Hadhrat Shāh Ghulām Alī and then received Sulook from Shāh Abū Saeed. Hadhrat Maulānā Ghulām Muhammad: came from Attock and received spiritual training from Shāh Abū Saeed while Hadhrat Shāh Ghulām Alī was still alive. Hadhrat Miān Asghar (d. 1255 AH), buried in Khanqah Mazharia, Delhi.